I LIKE to multi-task, which is handly because as a journalist I work on several things at the same time. Quite often I will be writing a feature while answering the telephone to speak to a contact about a news story I’m working on, while patting my head and rubbing my stomach. It’s quite a skill. So you can imagine my disappointment when I left for a meeting in Leeds last week and was unable to use my multi-tasking abilities in our SEAT. 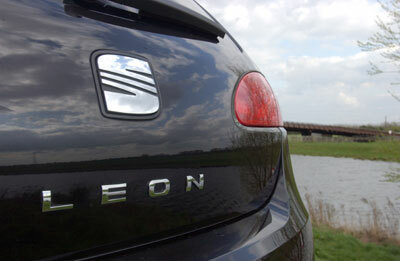 I had a two-hour drive up the monotonous A1 to a destination I hadn’t been before so I programmed the location with ease into the Leon’s satellite navigation system (an optional extra at £1,590). The route was calculated, cruise control was on and I sat back to enjoy the journey to Yorkshire. After a coffee stop I decided it was time for a bit of Gnarls Barclay but to my disappointment I found that as the sat-nav is linked to the CD player you can’t use both simultaneously. As I didn’t know the exact location I was going to, and hadn’t brought a map, I had to spend the rest of the journey with just the radio for company, which after a few hours of trite DJ talk became very tedious. However, all is not lost as there is an iPod/MP3 player dock inside the cabin (although this is a £75 option), which is great if you’ve got one – and a great excuse to buy an iPod if you haven’t already. On another note, the broken number plate has now been fixed. In my last long-term report the plate had broken away from the front bumper of the car, but a 10-minute trip to our local SEAT dealership in Peterborough and it was good as new. This seems to be a problem with certain Volkswagen Group cars as the numberplate on our Audi A6 long-termer also became unstuck. Perhaps some stronger glue needs to be ordered. Elsewhere, the Leon range has undergone something of an upheaval, with the result that our Sport model is no longer available. With the arrival of the more driver-focused FR hot hatches, the Sport has now become the Reference Sport, although this model perversely does without our car’s sports suspension. It still uses the same 2.0-litre, 140bhp TDI engine though, which is a good thing as it’s a strong performer. It’s returning more than 40mpg – nowhere near SEAT’s claim, but respectable for a sporty hatchback. like this.